I think this bird from the Rubber Stamp Gallery looks pretty cool, I'm not sure what it is but it looks like a sea bird to me. In fact the stamp is of a bird on a plinth, but I chose to have it standing in the water... which is the theme at Less is More this week. I stamped him and then masked him, to ink the sky and the sea. I had fun with that by stamping and inking and painting and embossing until I thought it looked OK! I was quite pleased in the end. I was unsure of what to add as a sentiment so I didn't add any at all. This used a stamp from Stampendous, coloured with watercolour pencils and blended with a water brush. I added some Glamour Dust to the sea for added sparkle. I find that using watercolour pencils even after blending with water, doesn't bleed though onto the inside of the card, an important factor in One Layer Cards. Both cards are beautiful OLCs. the sea is amazing on the card with the bird i think that's my favourtie anyway, well done! Both these are beautiful, Chrissie!!! You've done a great job with the water on both!!! The bird is so beautiful and I love the peaceful scene on the second!!! Both lovely!!!! These are beautiful! Especially love the seagull - very cute! I love both cards and am especially intrigued by the water on your first card. Could you elaborate on the process to acheive such a great look. What did you use to create the 'whitish spots' spots on the water? 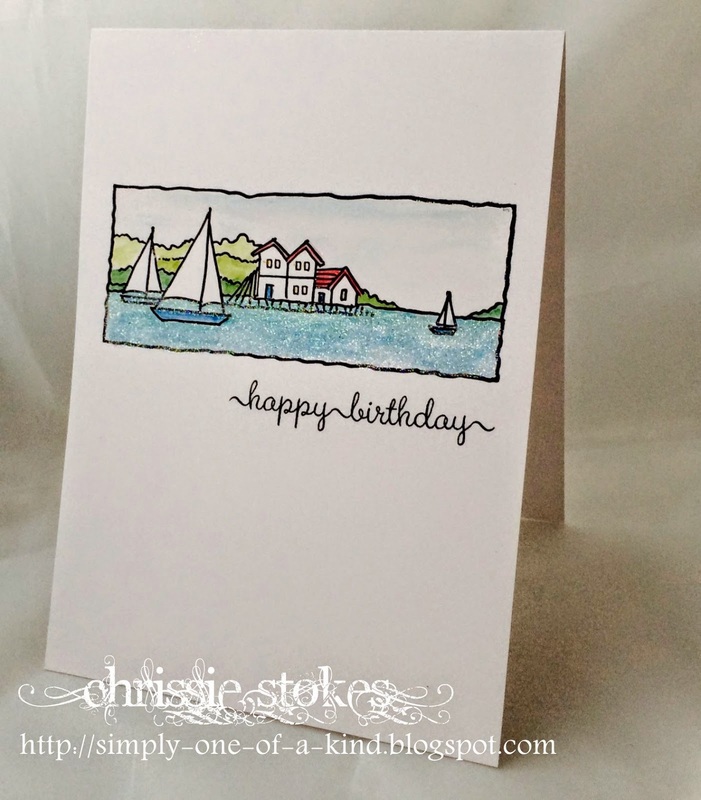 I stamped some Gorgeous Grunge lines from Stampin' Up across the bottom, inked with a sponge dauber in various shades of blue and green, using the daubers both flat and on the edges of them. The white foam was stamped with acrylic paint using a splat stamp and then clear embossed so that it would remain white with the other inking over it. When I was satisfied, I removed the mask which I had used to create the horizon. Both cards are beautiful, but the first one is particularly amazing...great job on the water and blue hues around the bird!!! By the sea, by the sea, by the beautiful sea -- love both cards. I'm feeling very nautical after looking at these gorgeous makes. I really like your decision not to put a sentiment on that lovely first card. It would have detracted from the gorgeous simplicity of that water. this is one fab card ! great ! Lovely, the water on the first one is amazing and cute bird! Your creation are always so beautiful! Fabulous cards, Chrissie, the first one is precious. 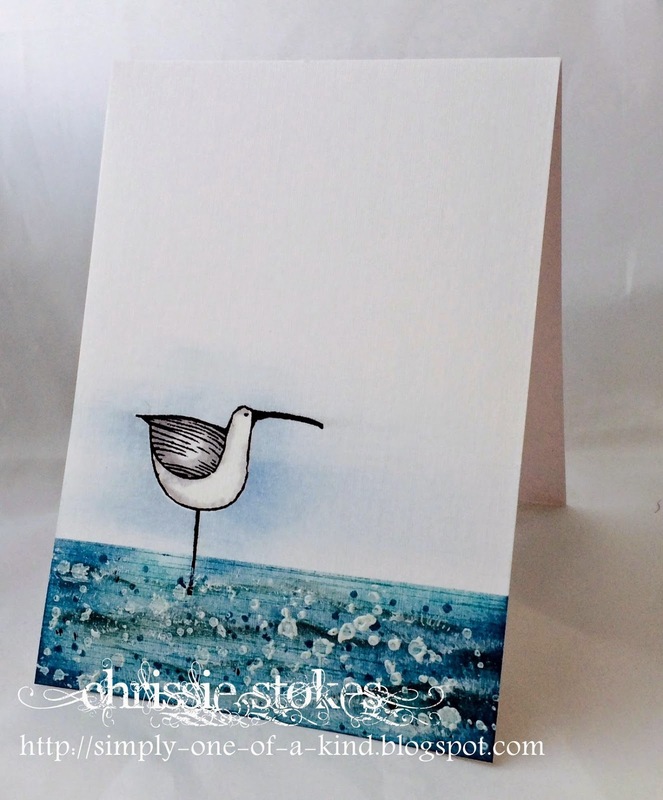 Beautiful cards Chrissie-you really should frame the Seagull-stunning effect! Just love that frothy water on your first card.